Welcome to part 2 of my little series Granada in under 1,000 words. One of my favourite things to do (anywhere in the world) is go to cafés, bars and restaurants. Nothing beats sitting down for coffee and cake, tapas and drinks or a good meal out. I am sure I share this hobby with many people! 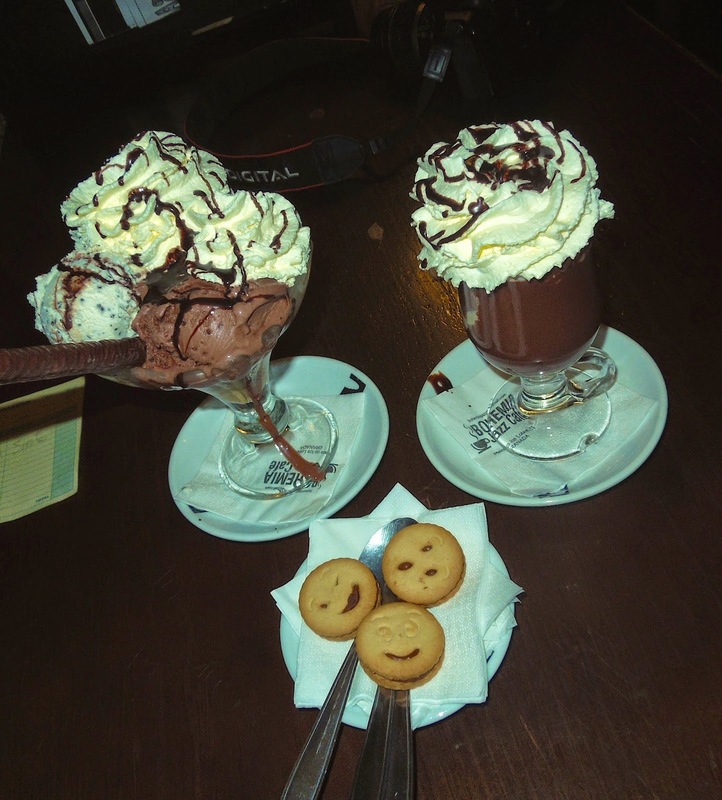 In my first few weeks in Granada, I discovered the cutest little café in a side street called “La Qarmita”. It became my regular café to go in the mornings to read and relax. One entire wall in the café is covered in books that you can borrow while in the café and read. They have many different categories and even an English section! 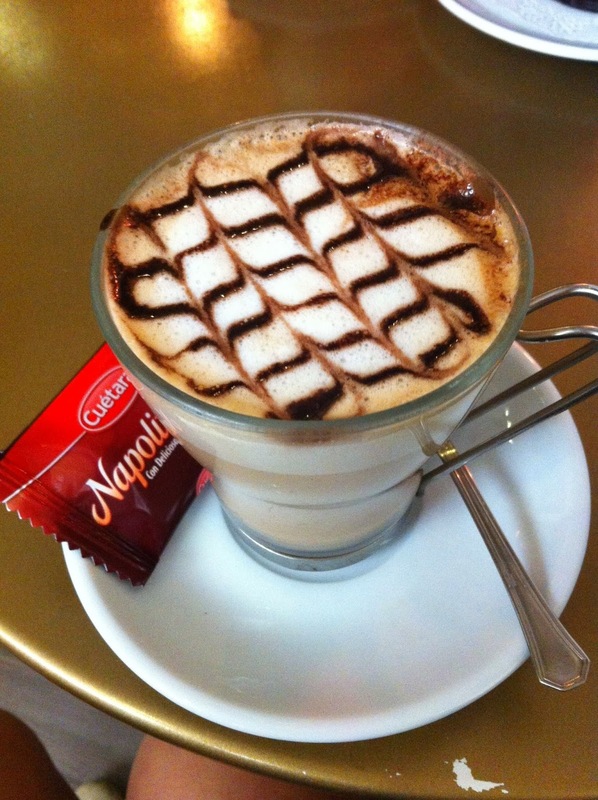 It’s such a nice relaxed and comfortable vibe in this café, and the cappuccino is the far the best I’ve found in Granada. 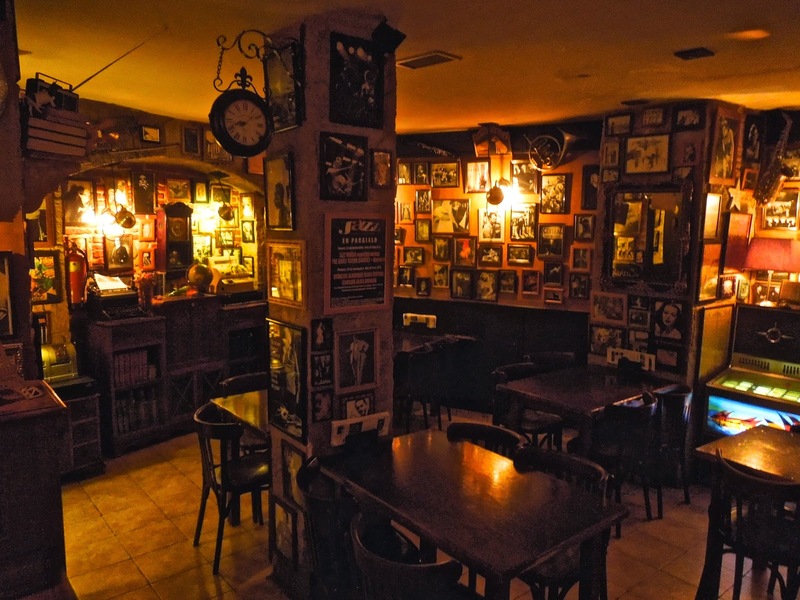 Another fantastic bar/café in Granada is the Bohemiá Jazz Café. Located in Plaza de los Lobos, it doesn’t look like much from the outside. In fact, it doesn’t really look like anything. Blacked out windows make it look permanently closed (and slightly dodgy), but once you open that door, you’re in for a magical surprise. 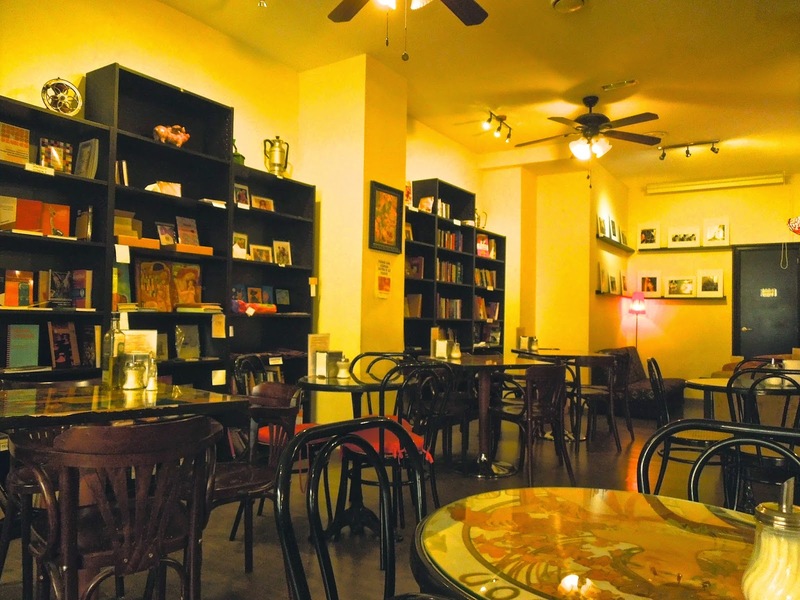 The interior of Bohemiá Jazz Cafe. One of my ultimate favourite things about Granada is tapas. Now my definition of tapas my vary from yours as, before I came to Granada, I thought of tapas as slightly overpriced mini meals that serve the purpose of sharing (but always leave you hungry and wanting more). In Andalucía, tapas are small complimentary plates of food that come with every drink you order. Yup, you heard me correctly, they’re FREE. Free food = a happy Ellora. The size and quality of tapas vary from bar to bar, but if you know where to go, you can fill up on amazing tapas for the small price of a few drinks. My 3 favourite tapas bars in Granada would have to be Los Manueles, Bodegas Castañeda and La Antigualla. I have found that Los Manueles consistently maintains a high quality of tapas, with varying dishes for every drink you order. 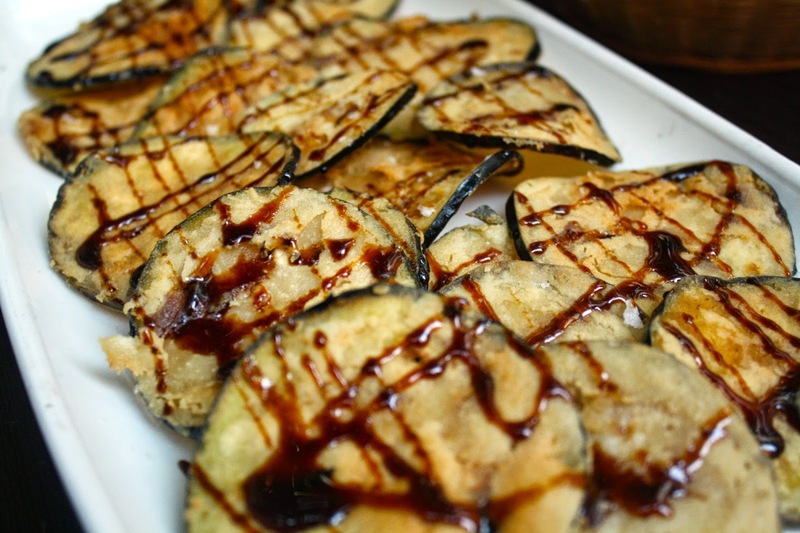 The berenjena fritas con miel (deep fried eggplant with honey – don’t knock it ‘til you try it) at Los Manueles are divine. Bodegas Castañedas is a typical Spanish tapas bar. You fight for a table or even a place to stand and Jamón (cured Spanish ham) hangs above your head. This bar has delicious, authentic Spanish paella as the first tapa during the day. Well worth a visit! The other place worth mentioning is La Antigualla. There are 2 bars, both on Calle Elvira (ridiculously close to each other). The tapas here are much more about quantity rather than quality. Don’t get me wrong, they’re still pretty yum, but more along the lines of greasy burgers and fries rather than traditional Spanish food. The reason I really like this tapas bar is that you practically get a whole meal as a tapa. The portion sizes are very generous, and for this reason it’s unsurprisingly popular with students. I do have to mention the weird and random but kind of cool décor that this bar sports. It’s has a medieval theme, with suits of armor, over-the-top chandeliers and flickering “torch” lights. Now I’m wishing I had a photo of the inside to show you – you have to see it to fully understand!